Elvis rocks out near a poster for the movie "Hanna"
Yesterday I went to see Hanna at Cinema City. It’s the second movie I’ve seen in a movie theater since we moved here. 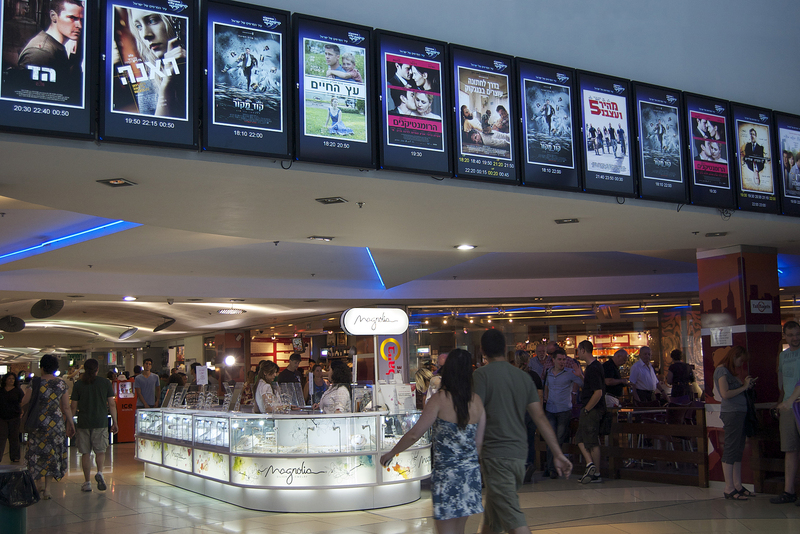 Both times I went to Cinema City in Ramat HaSharon, a multiplex with 18 screens housed in a shopping mall. It was one of the few public places alive with action on Shabbat when most shops and restaurants are closed. Hanna is an action/thriller, about a 16-year-old girl who has been raised by her father in a remote location in Norway, has never had contact with the outside world and has been trained to be an assassin. Preposterous premise, right? But it was well acted, action-packed with a few comic moments and surprise twists. 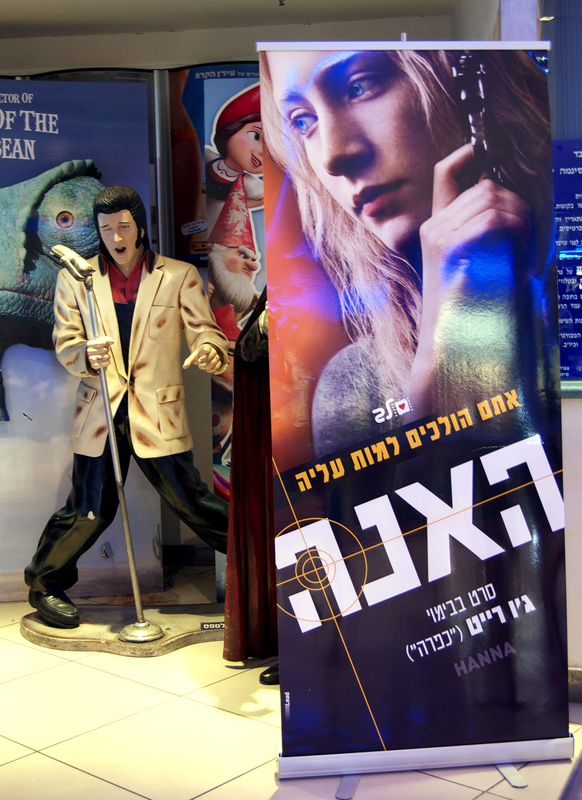 Movies are usually shown in the original language with Hebrew subtitles. Great, this movie was made in the U.S. so no language problem, right? But the movie changes locale frequently; some of the scenes that take place in Morocco were spoken in Arabic, so I missed out on that, but did okay with the German dialog that took place in Berlin. In Israel, or at least in Cinema City, one gets an assigned seat when purchasing a ticket. Tickets for the 3:50 p.m. matinee were 38 shekels ($11). I paid 19 shekels ($5.50) for the smallest tub of popcorn (tasty but oversalted). I rather like having an assigned seat. I chose an aisle seat and, since I arrived while the commercials were running, I was able to easily slip into my seat without having to peer around the theatre to see what was available. Yes, just as in the U.S., they run endless commercials before the movie starts, and then several trailers. Choices for moviegoing in Herzliya are pretty good. There is an art house cinema in Herzliya called Cinematheque which I hope to go to some day, as well as a small theater in one of the hotels at the beach which generally plays arty/foreign films. 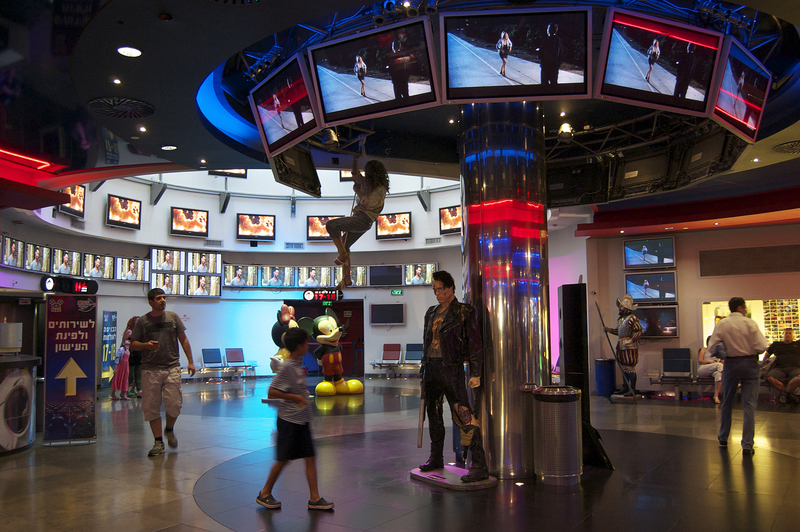 There’s another cinema complex at Seven Stars Mall with more typical blockbuster fare.